150 The course of our religious history as well as an essential part of our psychic development could have been predicted more or less accurately, both as regards time and content, from the precession of the equinoxes through the constellation of Pisces. The prediction, as we saw, was actually made and coincides with the fact that the Church suffered a schism in the sixteenth century. After that an enantiodromian process set in which, in contrast to the ” Gothic” striving upwards to theheights, could be described as a horizontal movement outwards, namely the voyages of discovery and the conquest of Nature. The vertical was cut across by the horizontal, and man’s spiritual and moral development moved in a direction that grew more and more obviously antichristian, so that today we are confronted with a crisis of Western civilization whose outcome appears to be exceedingly dubious. 151 With this background in mind, I would like to mention the astrological prophecies of Nostradamus, written in a letter x to Henry II of France, on June 27, 1558. After detailing a year characterized, among other things, by U 6 with $ Q ff ? he says: Then the beginning of that year shall see a greater persecution against the Christian Church than ever was in Africa, and it shall be in the year 1792, at which time everyone will think it a renovation of the age. . . . And at that time and in those countries the infernal power shall rise against the Church of Jesus Christ. This shall be the second Antichrist, which shall persecute the said Church and its true vicar by means of the power of temporal kings, who through their ignorance shall be seduced by tongues more sharp than any sword in the hands of a madman. . . . The persecution of the clergy shall have its beginning in the power of the Northern Kings joined by the Eastern ones. And that persecution shall last eleven years, or a little less, at which time the chief Northern king shall fail. However, Nostradamus thinks that “a united Southern king” will outlast the Northern one by three years. He sees a return of paganism (“the sanctuary destroyed by paganism”), the Bible will be burned, and an immense blood-bath will take place: “So great tribulations as ever did happen since the first foundation of the Christian Church.” All Latin countries will be affected by it. 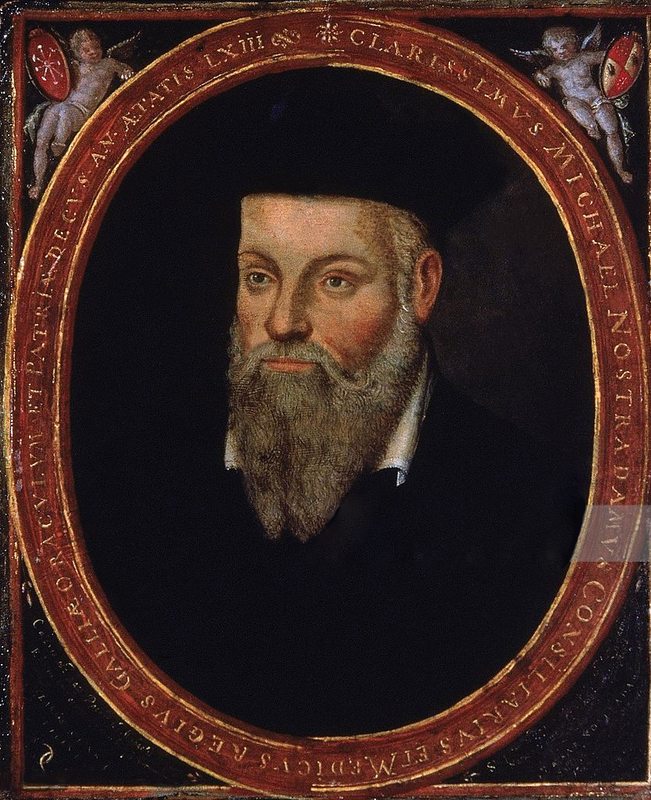 There are historical determinants that may have moved Nostradamus to give the year 1792 as the beginning of the new aeon. For instance, Cardinal Pierre d’Ailly, basing himself on Albumasar, writes in his Concordantia 5 on the eighth coniunctio maxima, which had been calculated for 1693: And after that shall be the fulfilment of ten revolutions of Saturn in the year 1789, and this will happen after the said conjunction, in the course of ninety-seven years or thereabouts. . . . This being so, we say that if the world shall endure until then, which God alone knows, then there will be many and great and marvelous changes and transformations of the world, especially as concerns law-giving and religious sects, for the said conjunction and the revolutions of Saturn will coincide with the revolution or reversal of the upper orb, i.e., the eighth sphere, and from these and other premises the change of sects will be known. . . . Whence it may be concluded with some probability that this is the time when the Antichrist shall come with his law and his damnable sects, which are utterly contrary and inimical to the law of Christ; for, being human, we can have no certainty with regard to the time and the moment of his coming. e . . Yet, despite the indeterminate statement that he will come at approximately that time, it is possible to have a probable conjecture and a credible hypothesis in accordance with the astronomical indications. If, therefore, the astronomers say that a change of sects will occur about that time, then, according to them, a Mighty One will come after Mahomet, who will set up an evil and magical law. Thus we may surmise with credible probability that after the sect of Mahomet none other will come save the law of the Antichrist. 54 In connection with the calculation of the year 1693, Pierre d’Ailly quotes Albumasar as saying that the first coniunctio maxima of Saturn and Jupiter took place anno mundi 3200. To this Albumasar added 960 years, which brings us to A.D. 1693 as the year of the eighth coniunctio maxima In Part III of his book, chapter 1 7, Pierre d’Ailly criticizes this view and calls it a “false deduction.” In his treatise against ‘superstitiosos astronomos,” 1410, he maintains that the Christian religion should not be brought under astrological laws. He was alluding in particular to Roger Bacon, who had revived the theory that Christianity was under the influence of the planet Mercury. Pierre d’Ailly held that only superstitions and heretical opinions were astrologically influenced, and especially the coming of the Antichrist. We are probably right in assuming that these calculations were known to Nostradamus, who proposed 1792 as an improvement on 1 789. Both dates are suggestive, and a knowledge of subsequent events confirms that the things that happened around that time were significant forerunners of developments in our own day. The enthronement of the “Deesse Raison” was, in fact, an anticipation of the antichristian trend that was pursued from then onwards. The “renovation of the age” might mean a new aeon, and it coincides in a remarkable way with the new system of dating, the revolutionary calendar, which began with September 22, 1792, and had a distinctly antichristian character. What had been brewing up long beforehand then became a manifest event; in the French Revolution men witnessed the enantiodromia that had set in with the Renaissance and ran parallel with the astrological fish symbol. The time seemed a significant one astrologically, for a variety of reasons. In the first place this was the moment when the precession of the equinoxes reached the tail of the second fish. Then, in the year 1791, Saturn was in T, a fiery sign. Besides that, tradition made use of the theory of maximal conjunctions and regarded the year of the eighth coniunctio maxima 1693 as a starting-point for future calculations.12 This critical year was combined with another tradition basing itself on periods of ten revolutions of Saturn, each period taking three hundred years. Pierre d’Ailly cites Albumasar, who says in his Magnae coniunctiones: “They said that the change shall come when ten revolutions of Saturn have been completed, and that the permutation of Saturn is particularly appropriate to the movable signs” (T 5, ==, Itf). According to Pierre d’Ailly, a Saturn period came to an end in 1 1 B.C., and he connects this with the appearance of Christ. Another period ended in A.D. 289; this he connects with Manichaeism. The year 589 foretells Islam, and 1189 the significant reign of Pope Innocent III; 1489 announces a schism of the Church, and 1789 signalizes by inference the coming of the Antichrist. Fantasy could do the rest, for the archetype had long been ready and was only waiting for the time to be fulfilled. That a usurper from the North would seize power is easily understood when we consider that the Antichrist is something infernal, the devil or the devil’s son, and is therefore Typhon or Set, who has his fiery abode in the North. Typhon’s power is triadic, possessing two confederates, one in the East and one in the South. This power corresponds to the ‘lower triad.” Nostradamus, the learned physician and astrologer, would certainly have been familiar with the idea of the North as the region of the devil, unbelievers, and all things evil. The idea, as St. Eucherius of Lyons (d. 450) remarks, goes back to Jeremiah i : 14: “From the north shall an evil wind break forth upon all the inhabitants of the land/1 17 and other passages such as Isaiah 14 : igf. : How art thou fallen from heaven, O Lucifer, son of the morning! how art thou cut down to the ground, which didst weaken the nations! For thou hast said in thine heart, I will ascend into heaven, I will exalt my throne above the stars of God, I will sit on the mount of assembly in the far north. 159 In these circumstances it is hardly surprising that Nostradamus warns against the usurper from the north when foretelling the coming of the Antichrist. Even before the Reformation the Antichrist was a popular figure in folklore, as the numerous editions of the “Entkrist” 31 in the second half of the fifteenth century show.This is quite understandable in view of the spiritual events then impending: the Reformation was about to begin. Luther was promptly greeted as the Antichrist, and it is possible that Nostradamus calls the Antichrist who was to appear after 1792 the “second Antichrist” because the first had already appeared in the guise of the German reformer, or much earlier with Nero or Mohammed. We should not omit to mention in this connection how much capital the Nazis made out of the idea that Hitler was continuing and completing the work of reformation which Luther had left only half finished. 160 From the existing astrological data, therefore, and from the possibilities of interpreting them it was not difficult for Nostradamus to predict the imminent enantiodromia of the Christian aeon; indeed, by making this prediction, he placed himself firmly in the antichristian phase and served as its mouthpiece. Next Next post: Carl Jung on the "Subjective Level."